There you stand, eye-to-LED-display with all those pretty, flashing lights taunting you, calling you to the flippers, sounding the siren song, trying to coax you into inserting another dollar. You know you’re good, you can beat it, but you’re onto the pinball’s wily charms and last time you checked there was no coin slot. That’s because this pinball is on your computer. 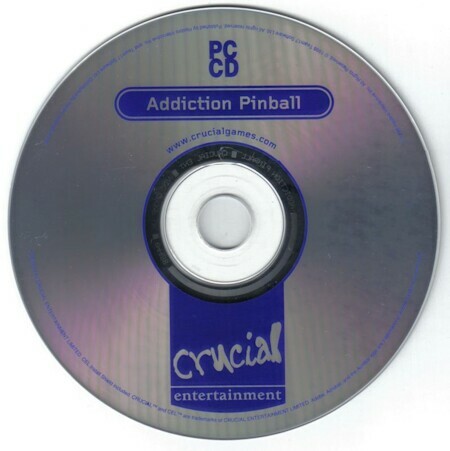 Addiction Pinball is just that: addictive. This game is about as real as a computer pinball game can possibly get. 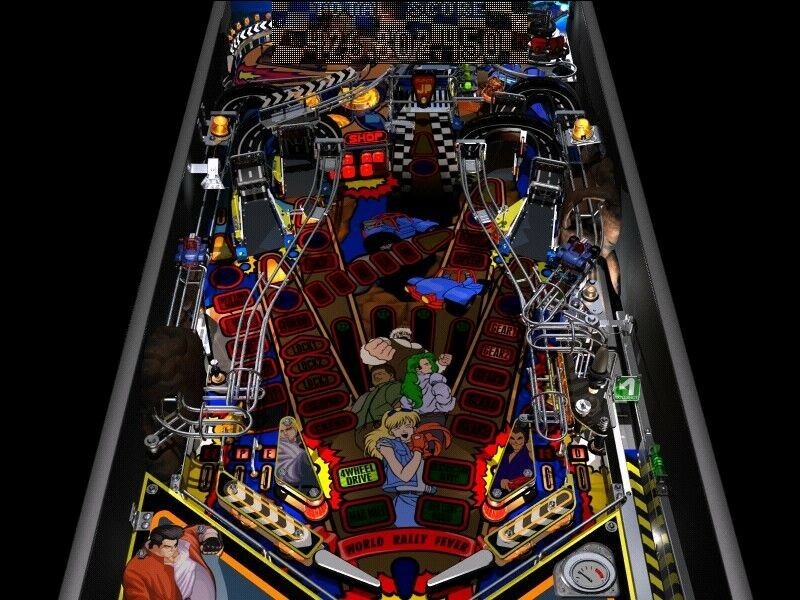 In fact, it is so realistic, even the Pinball Owners Association has given its endorsement. Try your skill and luck at two different tables based on two of Team17’s other games: Worms (which is a silly war-style game with worms) and World Rally Fever (which is a racing-style game). The controls are simple and just like a real pinball machine: two flipper buttons and a launch button (sorry, no pulling back the spring on these tables). In addition, you can also nudge the machine up, left and right, but don’t overdo it or you’ll end up tilting. 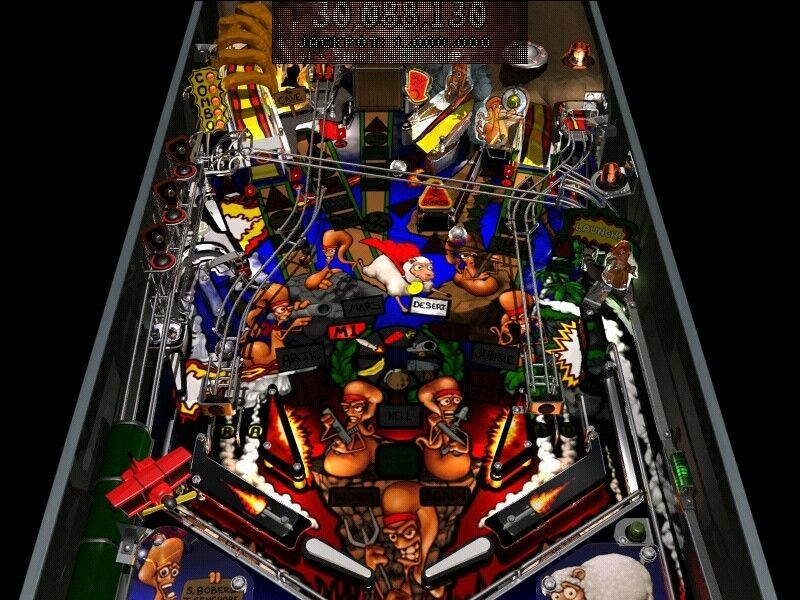 The main object in the game is that of every pinball game out there: score a lot of points. This is achieved with a variety of sub-games that require you to make various skill shots or play the “video mode” on the LED display. The most challenging of all aspects is the multi-ball mode where you play three balls at once! Overlapping the top of the table (due to lack of space on the screen) is the LED display that shows everything that is currently happening in the game. Both tables feature five viewpoints that can be used to see more of the table and take in all the beautiful graphics. Because the graphics are so nice, detailed, bright, flashy, and the table is two-dimensional it sometimes makes it hard to figure out exactly where your ball is when it rolls behind something until you’ve played awhile. I found that frequently switching the viewpoint helped until I understood where the ball goes when it disappears behind something. After you get past these two-dimensional limitations, the game becomes a lot of fun. Unlike other pinball games I have played, this one does not scroll which makes the game much easier to play, as you can see the whole table at a glance. If you have played a 90s era pinball machine, then you already know what these tables sound like. The individual sounds and music are very well done. While you are playing, the music tracks will change as things happen on the table. This game is rock-solid. Although I have a few gripes about it, they are mainly due to monitors being two-dimensional (which I suppose I can’t blame the software developers for). It is games like this that make you want to have a holographic display. Until that day comes, this is the closest you can possibly get to a real pinball machine. It looks great, it sounds great, and it plays even better. This is a must for all pinball enthusiasts.